When you consider ferret colors you should realize there’s a difference between the colors and ferret patterns. A lot of people mix these together. The color is basically the color of the hair, while the pattern distinguishes where those colors are situated. It may be hard to believe looking at black sable for instance, but all fuzzies are born completely white. Only the guard hairs change color with age. The guard hairs are the hairs of the top coat by the way. 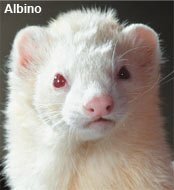 And before we humans started meddling with breeding fuzzbutts, there were only two colors in ferrets: albino and sable. Now, there’s a whole variety as you can see below. 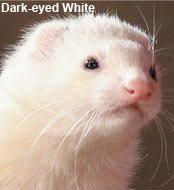 The albino ferret colors can range from snow white to yellowish white (what was that about yellow snow?). They have no patterns and the telltale albino red eyes. They also have a pink nose. 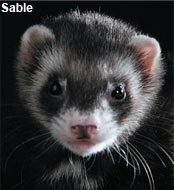 Sable is probably the most common of all ferret colors. The guard hairs of a sable ferret are dark brown, sometimes even black. The hairs of the undercoat are usually cream and can show through the upper coat. The eyes should be dark brown or black, while the nose can be anywhere from bright pink to pink with brown patches or even completely black. All sables have a cute mask around the eyes. A black sable ferret will seem almost completely black. The undercoat is a white or cream color, but because it barely shows through the upper coat you’ll hardly see it. The eyes are the same as from a sable; dark brown or black. The nose on the other hand should be blackish or ash brown in color. Though it can be dotted as well. Dark-eyed white fuzzies are also known as DEW’s. They’re not albinos, you can tell because they have…dark eyes ;-) These fuzzies don’t lack any pigmentation, and their guard hairs and undercoat can vary from cream to white. The color of their noses ranges from pink to black or even spotty. The cinnamon fuzzball varies in color, it can be almost blonde or light brown with a reddish tone. You’ll notice that the fur on the tail and legs is a bit darker than on the rest of the body. The mask on the face should be almost two shades lighter than the rest of the body. As for the eyes, they can be a light or dark burgundy. The nose should be pink, light brown, beige or brick colored. 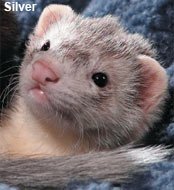 Almost the opposite of humans, silver ferrets (or grey ferrets) can lose all of the grey/silver as they age and end up as DEW’s. The guard hairs of the silver fuzzy can be silver, dark grey or even white. They come in a wide variety of patterns. Some seem to have definite ferret pattern while others have patches all over their body or rings around their tails. Most silvers don’t have a full mask. They usually do have smudges of silver around their dark brown or black eyes. The nose can be pink, black or spotty. Mmmmmmm, chocolate… Sorry got distracted there. As if fuzzies aren’t cute enough to eat, we had to create a chocolate version. The guard hairs are the color of milk chocolate, while the undercoat is white or even slightly golden. A chocolate’s eyes are a brown or dark burgundy. The nose is pink or brown, or a freckled combination of both colors. The last of the 8 ferret colors is champagne. It’s basically a toned down version of the chocolate. The undercoat is white or cream, while the guard hairs are tan or watered down chocolate. A champagne fuzzy has light or dark burgundy eyes. The nose should be pink or beige. A combination of both colors is also allowed. I’ll start with the easy one. Solid ferret patterns consist of only one color. If you brush against the hair you’ll see that a solid pattern still has a lighter undercoat. It just doesn’t shine through the guard hairs. The color of the nose depends on the color of the ferret. They should have a full mask or a so called T mask. A standard pattern fuzzy should only have about 10% white guard hairs, or less. The main difference with the solid pattern is that the concentration of color is less dense. Overall, standard fuzzies will appear lighter and you’ll definitely notice the points being darker in color. You’ll also notice a full or T mask. The roan pattern comes in any color and consists of 50%-60% colored guard hairs and 40%-50% white guard hairs. What kind of mask and color nose they have will depend on the color. All ferret colors can have mitts. Mitts are basically four white feet. Some fuzzies have completely white feet, while others only have white at the tips of their paws. These ferret patterns can also include a white patch on the knees, a white bib and/or white at the tip of the tail. Panda ferret patterns are pretty popular. A panda fuzzy should have a completely white head, neck, throat and shoulders. Around the eyes they have colored guard hairs, as well as on their back where it should be shaped like a saddle. Panda ferrets should also have the mitts pattern (white feet, tail tip and patched knees). The point or Siamese ferret patterns consist of darker tails and legs. Champagne points may not have a mask, but other ferret colors should have a thin V mask. The blaze pattern is a combination of the mitts pattern, with a white blaze going from the forehead, down the middle of the head to the shoulders. Most blaze patterns do not have a full mask. They can have colored rings or a small mask around their eyes. 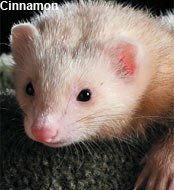 Important: A lot of ferrets that have the blaze pattern are deaf. Obviously you will have some sort of preference when it comes to ferret colors and patterns. It’s important to know though, that fuzzies can change color and pattern as they age or start shedding. Female fuzzies will change their coat when they’re in heat. Nibbler for example has sort of triangle on the top of his head, but only when he has his winter coat. What’s more, this last winter, the shape barely came through so it’s definitely changing. Stitch on the other hand was quite light as a kit and has gotten significantly darker when he reached adulthood. So just because you buy a silver panda now, doesn’t mean you’ll still have a silver panda 6 months from now. Don’t base your choice of a fuzzy solely on the color or pattern. Their personality is much more important. Tip: Don’t spend too much time trying to figure out what color or pattern your fuzzball is. The differences can be so small that it’s really hard to tell. Just enjoy your speedbump’s antics and wonder what he’ll look like next spring.